Planting & Growing Rhododendrons - Add Big Color To Your Landscape! Planting and growing Rhododendrons is an excellent way to add color, texture and beauty to your landscape. Rhododendrons almost always keep their over-sized foliage throughout the entire winter season. That alone makes them great for keeping a bit of color in beds long after most plants have shed their leaves for winter. But where Rhododendrons really come to life is in the spring. Their large, showy clusters of bright and often-fragrant flowers burst from funnel shaped buds. It is simply a magnificent site to behold! A Rhododendron bud gets ready to reveal its spectacular cluster of flowers. There are well over 850 varieties of Rhododendrons, which happen to be a cousin of the Azalea plant. Establishing them successfully all boils down to finding which of those 850+ varieties work best for your climate and landscape. When it comes to growing rhododendrons, it all starts with selecting a variety that works best with your climate. Their are plant types that can survive winters in near-arctic regions, and others that thrive where the temperature soars. The gorgeous blooms of a rhododendron can fill the landscape with vibrant color. We have included a few of our favorite varieties at the end of the article that cover many of the ranges, but as with any perennial, always start by reading the plant label to be sure you are selecting a rhododendron that will survive your climate. With rhododendrons, it is also important to consider where you will be planting. Most rhododendrons perform best planted where the morning or evening sun will provide most of their light. Avoid planting in full-sun portions of the landscape, or in areas that receive most of their light during the hot afternoon. Rhododendrons will perform best when planted for morning or evening sun. Like their cousin the azalea, rhododendrons prefer the soil to be slightly acidic. They grow and bloom best with a soil PH between 5 and 6. Last but not least, be sure to give plants enough space to grow. Some varieties of rhododendrons can grow and spread 4 to 6 feet or more. Again,be sure to read the plant tags to ensure you are providing enough room for the plants to grow as they mature. Rhododendrons do not require frequent or deep pruning. In fact, it can hurt the plant more than it helps. Most rhododendrons are evergreens. They are great for providing winter interest in the landscape. With that in mind, it is extremely important to give them the space they need when first planting. Rhododendrons should be planted in well-drained, rich, and slightly acidic soil. Dig holes to twice the size and depth of the root ball, and amend the soil with compost or peat-moss to help the plants retain moisture. Rhododendrons are a cousin of the Azalea, and like Azaleas, they prefer slightly acidic soil. Be sure when planting to keep the top of the root ball level with the soil line. If the ball is planted to deep it can create water-logging issues for the plant. On the other hand, if it is planted too high, the roots may not receive enough water. Water the plant thoroughly when planting to help it through the stress of transplanting. 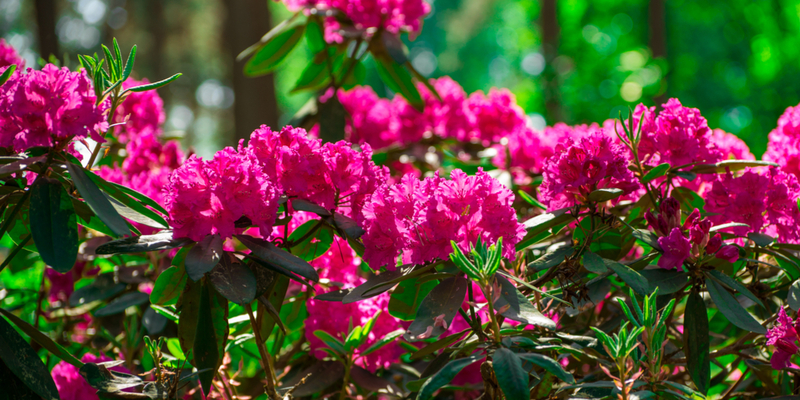 Mulch is key to keeping the soil temperature and moisture level regulated for Rhododendrons. Mulch to a depth of 3 to 4 inches. Pine bark or pine needles are an excellent choice as they are slightly acidic. As noted earlier, Rhododendrons simply are not fond of a lot of pruning. Even the buds of rhododendrons are spectacular. They can be lightly shaped when needed, but keep long term pruning chores to the basics of removing any damaged or diseased limbs. Deadheading spent blooms will help to promote new blooms. Simply cut or snap off old blooms at the base of the stem. Golden Torch is a low grower, maturing to a total of just 3 to 5 feet high. The cluster of blooms however are quite large for such a small plant, reaching 4 to 5 inches in diameter in full bloom. And those blooms are simply beautiful! Lasting for nearly a month, the blooms change and alter their colors in beautiful arrays of yellow, cream and orange. The PJM’s are fantastic for those looking for winter hardiness. They are one of the hardiest of all rhododendrons. Polar Night Rhododendrons are a great choice for those looking for a bit of a conversation piece. Their spectacular spring flowers are deep, dark and almost blackish in color. Plants grow to about 3 foot high and 6 feet in diameter at full maturity. Dividing Hostas And Daylilies In The Summer – How To Multiply Plants!